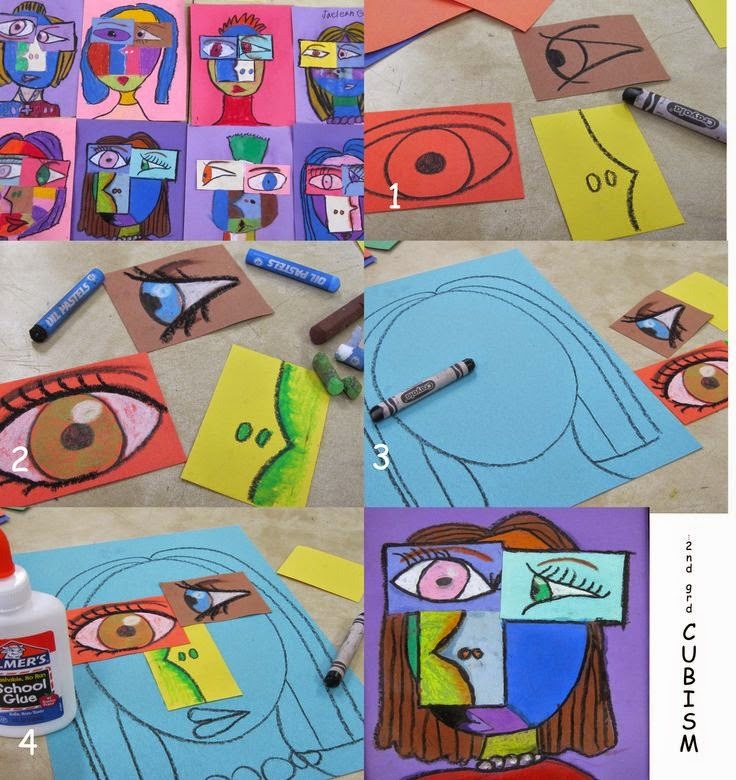 Multiple color cut out squares of construction paper for students to use for eyes, nose and mouth. Pablo Picasso was born on October 25, 1881 in Malaga, Spain. He was the first child of Don Jose Ruiz y Blasco, an art teacher, and Maria Picasso y Lopez. At an early age Pablo showed an interest in drawing. His first words were "piz, piz", which is short for "lapiz", the Spanish word for pencil. At the age of 7, Pablo began receiving art instruction from his father. His father believed that an artist's training should include copying the masters and drawing the human body from plaster casts and live models. The precision of Pablo's painting technique grew until it soon surpassed that of his father. In 1895, Pablo's father accepted a position at Barcelona's School of Fine Arts. He asked officials to allow his son to take the entrance exam. The officials were impressed with Pablo's abilities and admitted him to the academy. As a student he lacked discipline but made friends and continued to grow as an artist. At the age of 16, Pablo's father enrolled him in Spain's most distinguished art school, Madrid's Royal Academy of San Fernando. However, his instruction at the Royal Academy lasted only a short time as he struggled to accept formal instruction. In spite of these difficulties, his time in Madrid was not wasted. Pablo visited Madrid's museums and saw the paintings of Diego Velasquez and Francisco Goya, though it was the works of El Greco that he admired most. In 1900, Picasso made his first trip to Paris. At that time Paris was considered to be the art capitol of Europe. While in Paris, Picasso's work began to attract the attention of art collectors. By 1905, he had become a favorite of American art collectors Leo and Gertrude Stein. It was through them that Picasso met French artist Henri Matisse. The two became lifelong friends. In 1907, Picasso painted one of his most important works - Les Demoiselles d'Avignon, - creating with painter and sculptor Georges Braque the brand new art movement known as "Cubism". Cubism allowed the artist to show his/her model from many different viewpoints. In the paintings of earlier times, the artist showed his subject from one particular viewpoint. 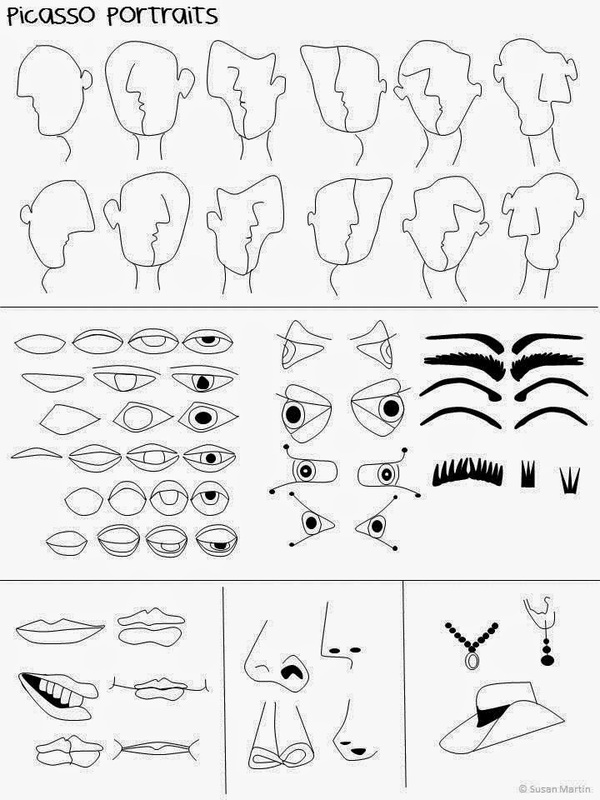 In cubist paintings the artist may show the front and the side of a person's face at the same time. Pablo Picasso died on April 8, 1973 in Mougins, France. He is best remembered as the co-founder of Cubism, and for Cubist works Les Demoiselles d'Avignon (1907), Three Musicians (1921) and Guernica (1937). STEP 4: Use oil pastels to color in eyes, nose, and mouth. Have fun with blending and adding special touches. STEP 5: On 9x12 construction paper, have student draw shape of face, hair and neck with black crayon. STEP 6: Glue eyes, nose, and mouth to picture.